In Morse Code Mambo, students make music with letters and words — please also see my Morse Code Music page. Our language is based on the Alphabetic Principle — how we associate sounds with letters and use these sounds to make words. In the Morse Code Mambo activity, we use Morse Code as a rhythmic version of our alphabet. We start by learning letters and then combine our letters to make words. In the process, we make some wonderful connections between rhythm and language. In the Morse Code Mambo activity package, Phil provides you with everything you need to present an interactive musical program that also compliments your school’s standards-based Language Arts curriculum! Phil includes the exact music and visuals he uses when he presents this activity at his popular Rhythms of Language family nights. During his family nights, Phil passes out cards and combs to the kids, and they play their Morse Code rhythms on their Card and Comb Guiros! As part of this package, you will get two versions of Phil's music file: one with him talking and guiding your students through the activity, the other without any talking — just music. Whether you're interested in a guided activity for a small group of students, or want to present an activity for the entire school, Phil includes everything you need to generate your visuals, play the rhythms, and successfully present the activity. It’s perfect for music teachers, classroom teachers, drum circle facilitators, Morse Code enthusiasts, and anyone else who has a love for language and rhythm! To hear a sample, press the play button below — it will begin playing as soon as the file is completely loaded. This complete package (including step-by-step instructions, music and visuals) costs only $24.95. To download Phil's complete package containing three PDF files and two MP3 files for the "Morse Code Mambo" activity, click the "Buy Now" button. Besides the Guiro and the Card and Comb combination, there are many other instruments you can use for this activity. Any instrument that is capable of playing short and long sounds will work nicely. Many music teachers already own class sets of grooved rhythm sticks — these work quite well. 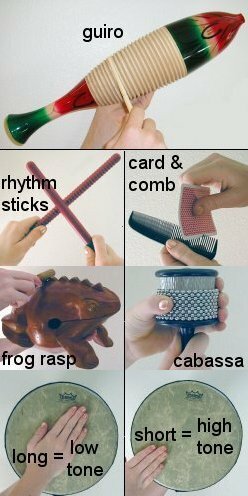 If you have a Frog Rasp (or Frog Guiro) or a Cabassa (or Afuche Cabasa) in your instrument collection, feel free to make them part of your group. Djembes, Congas, or any other types of drums can be used. Play low tones for the long sounds and high tones for the short sounds.